Hello! I’m very happy to be back here at Debbiedoo’s with another dessert recipe. This time I brought the most incredible Devils Food Cupcakes you have ever tasted! Moist and chocolatey with buttercream frosting. Oh. My. Gosh. 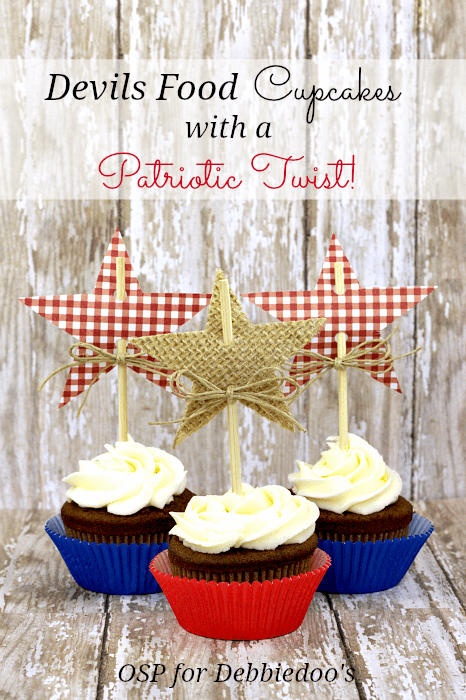 I put a patriotic twist on these since Independence Day is almost here. 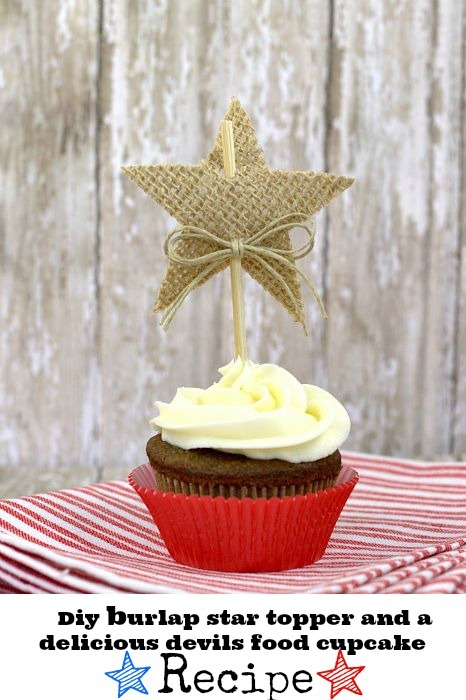 I made the star cupcake toppers from burlap and scrapbook paper. Cut out whatever size star you want from this star template. For the paper version simply trace the star on the back of your paper and cut out. Using a hole punch, punch 2 holes and insert a stick through the star. I added a little twine bow too. For the burlap star take 2 pieces of burlap and fuse them together with iron-on interfacing. Trace your star and follow the directions above. The interfacing takes care of any stray burlap threads and also makes the star stiff enough to thread the stick through. This recipe is from my old, battered Betty Crocker cookbook that I received when I got married. I use it for tried-and-true, good old basic recipes. This Devils Food cake is simple and straight-forward with an incredible result. Combine shortening, sugars, eggs, vanilla and melted chocolate. Add salt, baking soda and 1 c. flour. Slowly add buttermilk and remaining 2/3 c. flour. 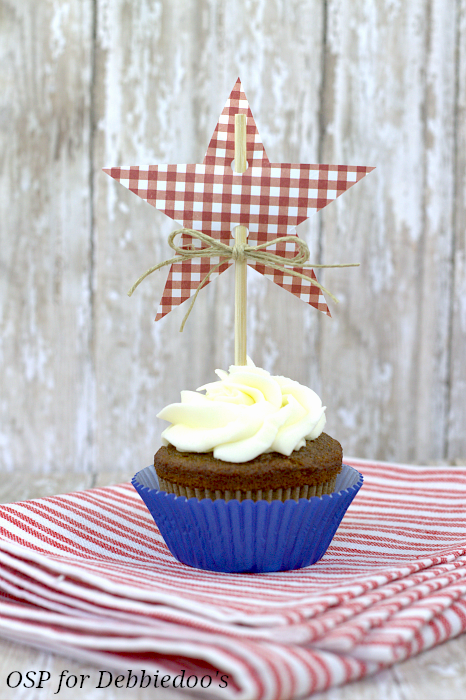 Frosting: Combine butter, powdered sugar and vanilla in the bowl of a standing mixer. Beat until fluffy. Add milk until desired consistency. I’d like to say thank you to Debbie…and to all of you who follow her blog and love her. She is one of the best and truest friends I’ve ever had. Not only has she helped me as a blogger, she has helped me be a better person. 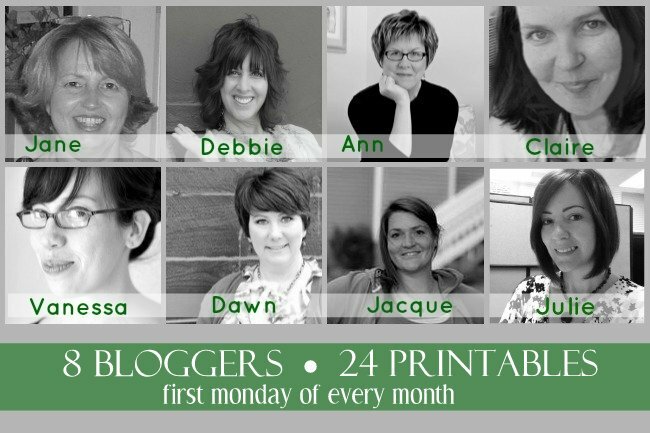 Don’t forget our monthly printable group will be posting on Sunday night, June 30th. 8 bloggers, 24 free printables. Please join us! Thank you Ann for not only the delicious cupcake recipe but for the cute little project to go with! If you do not know the lovely Ann, go on over and take a gander of her lovely blog. You will be sure to find other inspiring ideas. Nothing better than chocolate cupcakes! Devil’s Food cake is my favorite! Cute decorations, too! How cute are those Ann! And the best part is I could do that. These look darling & delicious! Pinned this qt right quick!! YUMMY! *and* AH-dorable. We have to supply snacks after worship @ church the weekend following Independence Day, and these might be a good idea. I want to do something fun and festive! These look great! 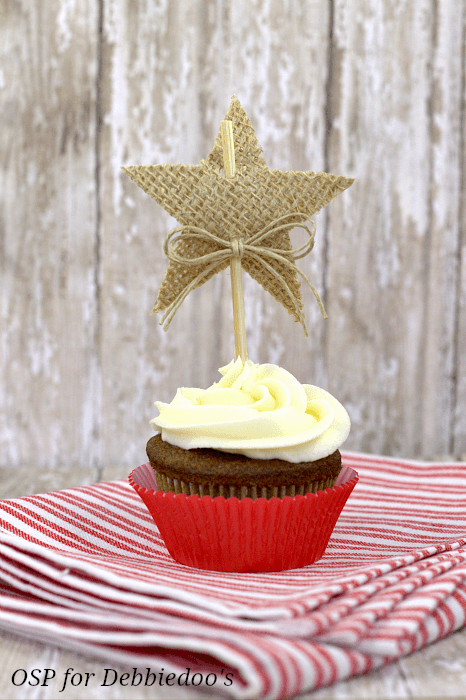 The stars I could make, but somehow, I doubt my frosting would come out as pretty as yours! Yummy and beautiful! I must admit, I never bake from scratch!! I use a box mix, but this looks great! YUM. Ann these look DELISH!! And such cute toppers too. These are so darn cute, Debbie. I love the starts!